270 pages | 84 B/W Illus. Drawing meaningful conclusions from organisational data is challenging, and theoretical frameworks can often illuminate information in fresh and useful ways. This book is one of the first to demonstrate how organisational semiotics can be applied to business informatics and information systems. Semiotics, a long-established discipline of signs, offers a rich philosophical and theoretical foundation for understanding information systems. This book demonstrates how applying the framework of semiotics to an organisation can provide insights into its communication needs, and as a result, enhance the design of its information system. The authors demonstrate how organisations collect, process, represent, store and consume information through a complex system which is aligned to support its objectives and enhance performance. 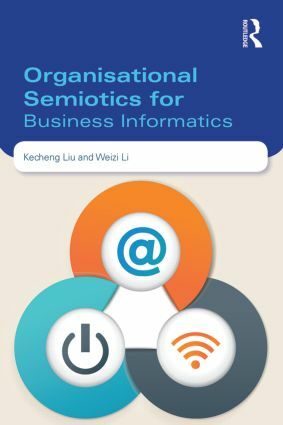 Organisational Semiotics for Business Informatics clearly introduces the basic principles and describes a set of methods and techniques rooted in organisational semiotics. These have been applied to business applications; demonstrated through real life case studies. This ground-breaking book has the potential to transform the theoretical understanding of information systems into the basis of a scientific discipline. Professor Kecheng Liu is Director of the Informatics Research Centre, Henley Business School at Reading, UK. He is a leading figure in Organisational Semiotics with extensive research into information systems and business informatics over the past 20 years.